​Until now the only motor-vehicle / cyclist incident data that law enforcement, traffic planners and government road safety funding agencies have had are collisions which are extremely rare events and severely under-reported. ​​Now cyclists can provide the most accurate picture of the risks they face by cycling with a camera and submitting all of their near miss incident reports to our free Incident Management System (IMS). Cyclists' incident reports can be used to charge drivers for criminal near misses, to send drivers non-punitive and educational 3 foot warning letters and to generate near miss data for mapping all near miss incidents. ​​Our groundbreaking work has defined what we call the near miss spectrum. We previously defined the concept of a criminal near miss which represents one end of the spectrum. You always know a criminal near miss when you see one as documented by the first video compilation of our members’ criminal near miss incident videos below. Criminal near misses include assault, when the driver intentionally meant to threaten a cyclist with bodily injury, and reckless driving when the driver showed a disregard for cyclists' safety such as endangering cyclists due to distracted driving. We have also secured legal precedents charging drivers for assault that all cyclists can leverage if their local law enforcement refuses to cite a driver. Criminal near misses should always be submitted to law enforcement to charge the driver, and to our IMS so cyclists can track, map, update and analyze all of their near miss incidents, search for repeat offenders, establish potential patterns of dangerous driver behavior, and generate near miss data to map dangerous locations - before collisions occur! ​​​In the middle of the spectrum is the hand signed 3 Foot Warning letter that we helped the California Highway Patrol (CHP) create. When a cyclist calls the Castro Valley CHP and tells them that a car came within 3 feet, i.e. they were “buzzed,” CHP will send the driver a hand signed copy of this letter. Drivers take notice when law enforcement demonstrates they take cycling safety seriously by sending one of these hand signed letters! This is the best non-punitive and educational tool to change drivers’ behavior - before collisions occur! Cyclists also submit these 3 foot violation incidents to our IMS so they can identify repeat offenders, establish potential patterns of dangerous driver behavior, and generate near miss data to map dangerous locations. You can view a copy of the letter below. 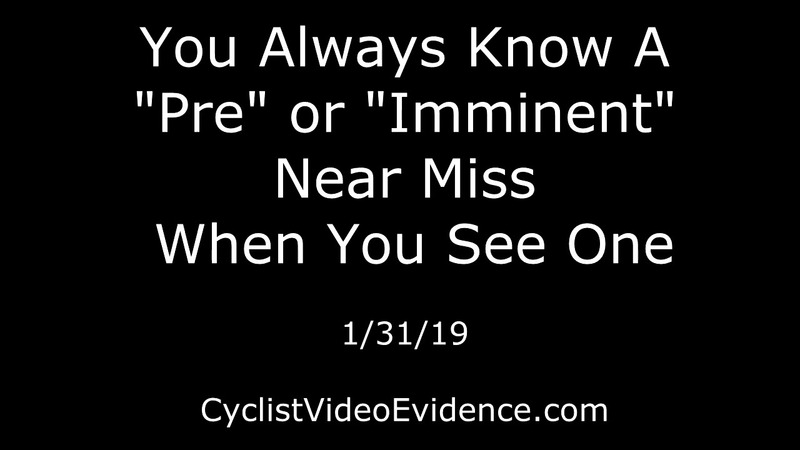 At the other end of the near miss spectrum we have defined “imminent” or “pre” near misses. Once again, you always know one when you see one so please watch our video compilation below. Cyclists do not submit these careless / negligent incidents to law enforcement but they do enter them into our IMS to generate near miss data to map dangerous locations for local traffic planners and engineers. Please join our free membership and help make cycling safer in your community by entering all of your near miss incidents in our free Incident Management System. We welcome all comments, thoughts or feedback by replying to our announcement post or by using our Contact Us form. You always know a criminal near miss when you see one! 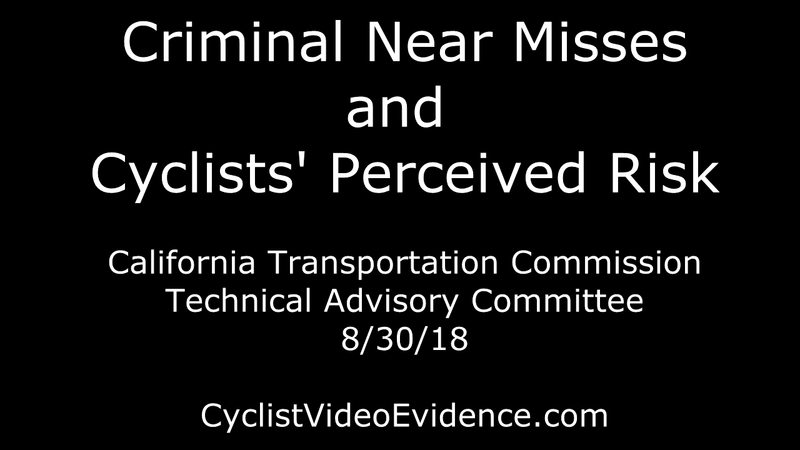 We showed this video compilation during our presentation to the California Transportation Commission - Technical Advisory Committee. You can read our post for more information. Be sure to view this in full screen! You always know a "pre" or "imminent" near miss when you see one! Management System so we can generate near miss data to identify potentially dangerous areas for traffic planners to consider road safety improvements.